Together, these three offensive linemen weigh almost 1,000 pounds. Do you think they drink beer or wine? Holla! They’re grapefriends! 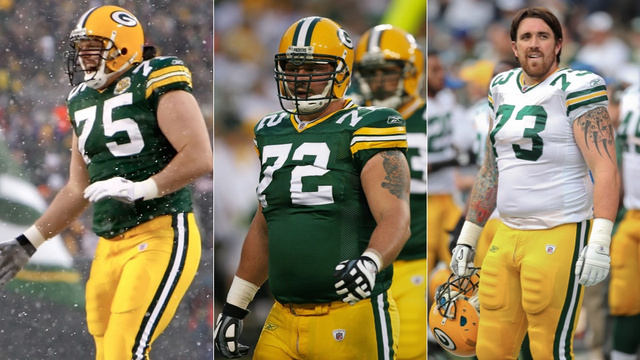 Daryn Colledge, Tony Moll and Jason Spitz were all drafted by the Packers in 2006. They’ve all moved on to other teams now but they make Three Fat Guys wine together and are about to release their third vintage of Cabernet Sauvignon from Napa. Let’s review a few other footballers who make Napa Cab: San Francisco 49ers Super Bowl champ and Hall of Famer Joe Montana’s Montagia, Packers cornerback Charles Woodson’s TwentyFour, former Cowboys coach Barry Switzer’s Switzer Family Vineyards, the Jets’ Uncorked, and the Chargers’ Legacy. So Three Fat Guys (love the name) Napa Cab is just a small production. They said they might start a “skinny” white wine for their wives, but I bet Bethenny would get all up in their grill about that. Anyway, they guys say they really just want to stock their fridges and have wine to give as presents. Colledge told a reporter, “We put enough in that we’ll pay attention to it, but if it went belly up, we’ve got a lot of wine in our fridges and we’ll be O.K.” Ha! I totally want to be their friends and possibly have them be my bodyguards as well. Do I need a bodyguard? Not really, but it would probably be cool to have one anyway. Their Cab goes for $28 a bottle. Are you a Packers fan? Would you buy it? Tags: Daryn Colledge, Green bay packers, Jason Spitz, three fat guys wine, Tony Moll. Bookmark the permalink.